Alistair 'Ally' was born in Bellshill, Scotland on 24 September 1962. Ally's famed footballing career took him from Fir Park Boys Club to St Johnstone (1978-1981), Sunderland (1981-1983), Rangers (1983-1998) and Kilmarnock (1998-2001). 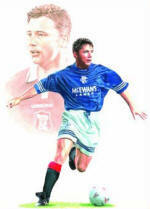 From his time with Rangers, he has 10 championship winners medals, one Scottish Cup medal and nine League Cup medals. He won the Golden Boot twice (1992, 1993) and was named Scotland's Player of the Year in 1992. Capped 61 times for Scotland, he scored 19 international goals and is one of only 23 players inthe SFA Hall of Fame. He was given the MBE for his services to football in 1996. In 1996, he became a team captain on BBC1's A Question of Sport and, each week, delights in embarrassing host Sue Barker as much as possible, particularly about her love for French charmer, David Ginola. He is also a regular football pundit for ITV, covering both the World Cup and the Premiership, on which he has a weekly "Ally's Golden Slot" slot. In 2001 he won the Television Radio Industry Club's Sports Presenter of the Year award. As befits a man who has always enjoyed an adoring female fanbase, he was included in Company Magazine's 100 Sexiest Men of the Millennium Although he only reached number 87 (three behind Darren Day! ), this ranks him higher than both Pierce Brosnan and Ben Affleck. In 2000, he made his acting debut in Robert Duvall's film A Shot At Glory, originally known as The Cup. In it, Ally ironically plays a former Celtic star, Jackie McQuillan, who is called upon to lift no-hopers Kilknockie to the heights of the Scottish Cup final. The Herald praised McCoist for "a surprisingly impressive debut".in which he "positively sweats on-screen charisma." High praise, indeed. The film was released in the UK in 2001 and in the US in 2002.